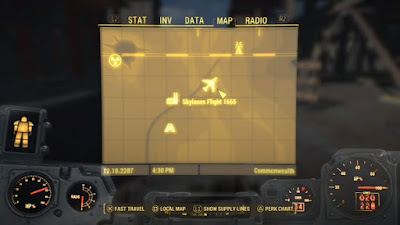 Perhaps the most difficult aspect of Skylanes Flight 1665 is finding the damned thing. It’s an impressive wreckage that you can see from afar - but to get there you need to wade into the Glowing Sea. Specifically, you need to proceed almost due east from the Crater of Atom, then keep your eye on your right as you walk. The metallic structure of the wreck should gleam from quite a distance. 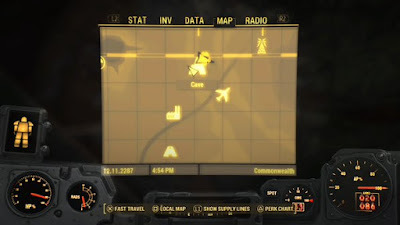 Alternately, if you follow the highway that curves through the Glowing Sea on the map (it’s only kinda there in reality) you’ll find the wreck as you head south. Be careful of copious Rad absorption and an abundance of Radscorpions / Radroaches / Bloatflies / Ghouls / Bloodbugs as you travel. Check the underside of the cockpit chunk to find a storage compartment with lots of pre-war clothing, if you want to look old school fashionable again. Follow the plane’s bits southwest and you’ll find the occasional item among the seats, but nothing terribly useful. (Be careful if you decide to dip under the tail, as there’s a large number of Bloatflies waiting to jump out at you down there.) Continuing this way has its rewards, however, as you’ll find Sentinel Site Prescott waiting at the end of the trek. The landing gear sits partially submerged in toxic goo to the northeast of the front of the plane. There are no items to grab, but there are Bloodbugs over here, and one of the ones I fought was Legendary. Always good for loot, but, be careful, as these things are crazy dangerous when they get into striking range. The Cave with the Raider Power Armor. 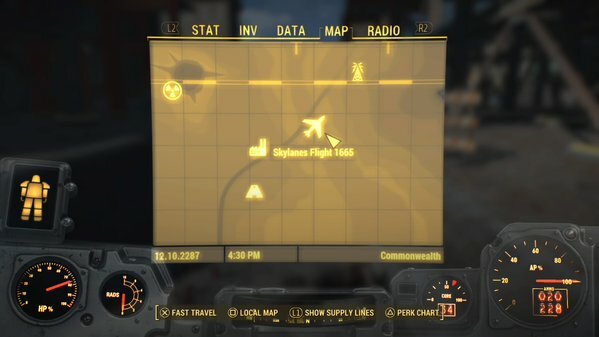 Skylanes Flight 1665 is down and to the right of the Cave.